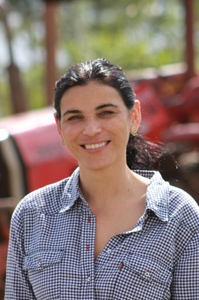 Susana Fallas (‘01, Costa Rica) chose to study at EARTH University because of its social and entrepreneurial emphasis. What she didn’t expect was that she would be linked to the University for the rest of her life. Susana is from the town of Paraiso, in the mountainous province of Cartago, Costa Rica. Her family owns an agricultural business, which is where Susana learned to love and appreciate agriculture and the environment. After graduating from EARTH, Susana returned to work with her parents and at the Ambio Foundation, a non-profit organization that specializes in environmental law and policy research. In 2002, she moved to Mexico to purse a Master’s degree in Industrial Administration. After completing the program, she remained in Mexico organizing and leading projects in rural communities throughout the state of Tabasco in southeastern Mexico. As she worked in these communities, she began to see enormous opportunities to promote development and environmental education. So in 2009, she created the Hijos de la Tierra Foundation (Hijos de la Tierra translates as Children of the Earth), a non-profit organization dedicated to educating and addressing the needs of the communities that she had grown to love. Today, her organization offers a variety of practical workshops which are offered based on the needs and interests of the community. Over the years, her Foundation has implemented workshops on organic fertilizers, waste water treatment, integrated farm management, livestock nutrition, rainwater collection, palm oil processing and cacao production, to name a few. Currently, Susana is working with EARTH alumni to spearhead an ambitious new bio-digester project in the state of Hidalgo, Mexico. Bio-digesters process organic waste like plant material, or human or animal feces and collect the methane emitted during the decomposition process. The gas can later be used in a burner for heat, to cook food, or to power an electric generator providing a two-fold solution for waste management and renewable energy for rural communities. The project will install four different bio-digester models in self-sufficient elementary schools and the models will be evaluated for their efficiency and durability. Once the best option is identified, Susana hopes to be able to install many more of these bio-digesters in schools throughout the region. In addition to her dedication to renewable energy, Susana also works to protect the environment through her collaboration with the Carbon Neutral Unit at EARTH. Together with unit director Edmundo Castro, she is working to certify two companies in Mexico as carbon-neutral organizations. She is also writing an educational manual that will be the first-of-its-kind to explain in detail the complex and rigorous process of obtaining carbon neutral certification. Currently, the regulations only exist in concise technical language and do not serve as a tangible guide for businesses interested in becoming carbon neutral. With her current projects in Tabasco and Chiapas and upcoming programs in Puebla and Hidalgo in 2014, Susana sees nothing but progress for the future of her Foundation and the communities in which it operates. She credits EARTH with providing her the skills she has utilized in her career.